Days of Future Past is a 1981 X-Men storyline (published in Uncanny X-Men #141 and #142note Technically speaking, only the second issue was marketed as Uncanny, but the earlier issues are referred to that way to reduce confusion and ambiguity), written after the successful The Dark Phoenix Saga by Chris Claremont and John Byrne. This time-travel story was the first main story featuring Kitty Pryde. The story, written in 1980 and first published in early 1981, was set in 2013. The United States is a dystopia, and people are divided into three groups: normal humans, normal humans with the potential to pass on the mutant gene, and mutants. The first ones are free, the second are forbidden to have children, and the third are either killed or held in concentration camps, with collars that turn off their powers. Everything is run by the Sentinels. And Europe has atomic bombs, ready to blast the US as soon as the Sentinels attempt to go outside America. 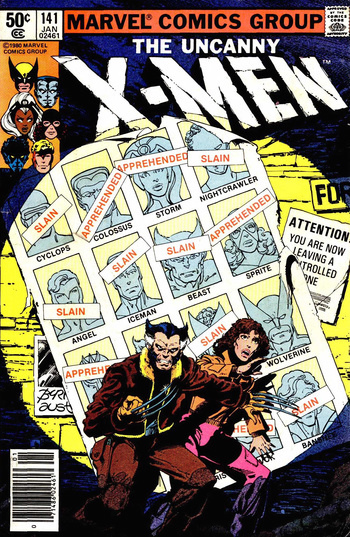 The group held in the concentration camp is composed of aged versions of the X-Men: Katherine Pryde-Rasputin (Sprite, later to be known as Shadowcat), Ororo Monroe (Storm), Peter Rasputin (Colossus), Franklin Richards (the son of the Fantastic Four's Reed and Susan Richards), Rachel (not given a surname here, but later revealed to be the daughter of Cyclops and Jean Grey) and Magneto (now in a wheelchair). With the help of Wolverine, still on the loose, they manage to send Katherine Pryde back in time to October 31, 1980, just before a pivotal presidential election, placing her adult mind in the body of her teenaged 1980 version. She tells the others that, on that day, the Brotherhood of Evil Mutants would kill the US senator Robert Kelly, along with Charles Xavier and Moira MacTaggert, which will lead to the anti-mutant hysteria. Meanwhile, in the Future..., the X-Men escape from the concentration camp, but leave Magneto behind to cover their escape. Franklin dies during the next Sentinel attack. Ororo, Peter, and Logan sneak into the Sentinel headquarters, the Baxter Building (the former base of the FF), realizing too late that the Sentinels allowed them to do so to capture and kill them. Wolverine, Storm and Colossus die, while Rachel remains outside, protecting the unconscious Katherine Pryde. In the present, the Brotherhood breaks into the Congress during a hearing on the "Mutant problem," but the X-Men turn up and fight it out, eventually defeating most of the Brotherhood, while Mystique escapes. Destiny, who left the fight earlier, attempts to kill Kelly, only for Pryde to save him at the last moment. Moments after she saves him, her adult mind returns to the future, restoring her teenaged identity. Though not as successful as Claremont' and Byrne's aforementioned previous work, Days of Future Past is commonly ranked among the greatest X-Men arcs and rarely places very far from the former. In a title with as many Bad Future storylines as X-Men it is, DoFP was the first and original one, and has been copied and revisited many times since. The seventh entry in the X-Men Film Series, X-Men: Days of Future Past, is based on this story; however, it was released in 2014, just missing the anniversary. However, the "Battle of the Atom" crossover was released in 2013 to coincide with the anniversary, and involves time traveling mutants who seek to stop an apocalyptic future. Notably, Bryan Singer's first X-Men movie also uses elements of the story, borrowing the central plot about the X-Men trying to stop a Brotherhood plot against the Mutant-hating Senator Kelly. Marvel officially revisited the story in 2015 under the title "Years of Future Past" as part of the Secret Wars (2015) storyline. Ambiguous Ending: Pointed out inside the story. Angel: Does that mean we changed the future? Xavier: I do not know, Warren. Cliché though it sounds, only time will tell. Animated Adaptation: This story was used as the underlying arc of the first season of the 1990s animated series of "X-Men", and was also the basis of the Bad Future B-plot for season 1 of Wolverine and the X-Men. As You Know: Franklin Richards uses these exact words when explaining to Magneto how the jammer works. Bad Future: The Sentinel-controlled future of this story is one of and easily the most famous of the X-Men's disturbingly large number of these. Beware the Nice Ones: Future Colossus goes absolutely berserk when future Storm is killed and throws a Sentinel out of a building. Embarrassing Nickname: Katherine Pryde (in the body of her teenager self, but with her adult mind from the future) does not like at all to be called "Kitty" again. She's "Kate"! Fastball Special: Future Colossus and Wolverine attempt it twice. The first time, it's successful. The second time... not so much. Foreshadowing: Colossus and Kitty are married in the future, and their marriage ceased to be along with the whole timeline. This was written years before their romance in the normal timeline (in fact, Kitty had met the X-Men during the Dark Phoenix Saga, moved to the mansion... and this is her first adventure as a member of the team). Still, that romance was also began by Claremont, who had a long run in the X-Men, so it can be either that he took advantage of a loose plot point he had left years ago, or that he planned it all along. Future Badass: All the characters (except those who have died), but most notably Kitty Pryde. At this point, she was still a new character, the token teenager Naïve Newcomer who has no idea about anything the adult superheroes do; and all of a sudden we see her as one of the last remaining members of the resistance in a future dystopia. Gone Horribly Right: In the original timeline, the Brotherhood killed Kelly to make humans scared of mutants. And it worked. But fear did not make humans bow down in obedience, fear made humans cross the Godzilla Threshold to end the Mutant threat. Also, the government designed the Sentinels with the programming to "do whatever it took" to end the mutant threat. The Sentinels concluded that this meant take over the government themselves and wipe out any super-powered people, mutant or not, as well as those who supported them. Grave-Marking Scene: There's a lot in the concentration camp with the graves of many people dead years ago: Johnny Storm, Ben Grimm, Charles Xavier, Scott Summers, Kurt Wagner, Susan Richards, Reed Richards, Lorna Dane, Henry McCoy, etc. HeelFace Turn: Magneto in the Bad Future. At this point, in the regular comics, he was not an anti-hero yet, he was still a full-time villain, but Claremont was busying sowing the seeds of his HeelFace Turn. Homage Shot: The cover art, shown above, is rather famous and recognizable, and has been homaged by numerous other comic book lines (including both Star Wars and Star Trek), particularly when a Bad Future story is being told. Humans Are the Real Monsters: Though the Sentinels have taken over the United States by 2013 and killed and imprisoned numerous mutants and other superpowered beings, it has to be remembered that it was ordinary humans who started the ball rolling after Senator Kelly's assassination. Indeed, Rachel Summers' flashbacks in later stories show the US military eagerly and gleefully massacring mutants before the Sentinels even took over, such as when the X-Mansion is destroyed in an artillery barrage and Charles Xavier, Illyana Rasputin, Nightcrawler and his pregnant wife Amanda Sefton are killed by the army, with Rachel being the sole survivor, or when Rachel is later used as a "Hound" to detect fleeing mutant civilians, who are subsequently massacred by the military. Humble Goal: Peter Rasputin, married with Katherine Pryde, is concerned about the possible consequences of their victory. If all reality is rewritten and that future never comes to pass, that would include their marriage. Katherine: That's a risk we have to take. What does the love of two people matter against the lives of billions? Peter: I am selfish. It matters to me. I Will Only Slow You Down: According to Wolverine, why the now-paraplegic Magneto stayed behind. Wolverine: He knew what he was doin' when he agreed to cover our escape. His wheelchair would've slowed us up too much. Impaled with Extreme Prejudice: A Sentinel shoots a huge metal spike through the future Storm. Irony: Future Magneto being in a wheelchair is a double one. The most obvious is the Master of Magnetism stuck to a metal chair. The second is how Magneto ends up becoming much like Xavier in the end. Kill 'em All: Warned in the cover of the second issue: "This issue everybody dies!" Luke, I Am Your Father: Mystique and Nightcrawler finally meet. Raven reveals she knows Kurt's identity and she hints at a relationship of some kind between the two, but stops short of outright revealing she's his mother. Meanwhile, in the Future...: A consequence of the unusual type of time travel. Besides, Kate made the trip early in the first issue, and we still need to know what things are going on at that bad future. Mutually Assured Destruction: On the international level (merely mentioned): the USA and Europe are each holding the sword of Damocles over the other. No Name Given: Rachel pointedly is never given a last name so that Claremont could reveal that she was Rachel Summers later on. Not Wearing Tights: Nobody does so in the bad future. O.O.C. Is Serious Business: One of the first indicators to the X-Men that something is seriously wrong with Kitty is when she hugs Nightcrawler (having previously been terrified of him). Outgrowing the Childish Name: Future Kitty Pryde no longer goes by that. She addresses to "Kate". The Reveal: Future Kate does not know which Brotherhood member killed Robert Kelly, and the story keeps it a secret right up until the attempt. Turns out it's Destiny. Set Right What Once Went Wrong: The whole point of the story. Storming the Castle: Averted. The X-Men thought that just three of them would simply get into the secured headquarters of the Sentinels and defeat them all... but it was a trap, and they are all slain. We Have Reserves: Destroy one Sentinel, destroy a hundred, a thousand, it does not matter. Their number is overwhelming. You Shall Not Pass! : The X-Men did this to the Brotherhood, when they tried to kill Kelly.